Born January 24, 1912 in Boston, “Bam Bam” Weekes went on to become the first USA-born Test cricketer. Abhishek Mukherjee looks at a career of one of the hardest hitters of the cricket ball. His problem lay elsewhere: as Cardus had added, he was “hopelessly short of aim and eyesight” (though this was before his famous onslaught at The Oval); however, on the occasions when he middled a ball, the fielders were left stranded, since chasing the ball would have been a futile effort. He was also a capable left-arm bowler and a reserve wicketkeeper. From a career spanning 30 First-Class matches Weekes scored 1,731 runs at an impressive 40.25 with four hundreds; he also finished with 12 wickets at 38.67 along with 21 catches and a stumping. Three innings from two Tests fetched him 173 runs at 57.67: it was unfortunate that the Second World War took away most of his career. Weekes was born in Boston of a Jamaican mother and a Barbadian father. He later went on to become the first USA-born Test cricketer (Jehan Mubarak, born in Washington DC, is the only other one till date). Some sources cite him as an elder cousin of Everton Weekes, but it is not a universally accepted fact. Bam Bam Weekes grew up in Jamaica and was spotted as a talent at a young age, but his earlier matches are not well-documented. The earliest chronicled match was for Jamaica Next on Yorkshire’s tour of Jamaica in 1935-36; he scored 14 in that match at Sabina Park. In 1938 he played Oxford and Cambridge Universities at the same ground — his maiden First-Class match. Jamaica were set 228 to win, and Weekes and Osmond Stephenson went after the ball, adding 122 in no time. Weekes eventually scored 106 on First-Class debut, but a collapse ensured Jamaica finished on 204 for 8. Runs kept coming: 58 in the next match against same opposition at the same ground; 88 against Trinidad (dominating a 151-run partnership with George Headley, no less); and 100* for Jamaica against Combined XI, again at Queen’s Park Oval. His first 4 matches fetched him 384 runs at 76.80, making him an obvious choice for the England tour of 1939. Weekes did not take the world by storm during first half of the tour, though he played a crucial role in donning the big gloves and providing the much-needed rest to Ivan Barrow. His chance came when he scored 55 against Minor Counties at Lord’s and 62 against Leicestershire at Aylestone Road. Barrow made his debut in the first Test of the three-Test series at Lord’s along with Jeffrey Stollmeyer, John Cameron, and Bertie Clarke. Rolph Grant chose to bat, and Weekes found himself walking out at 180 for three to join Headley. He scored 20 before he became one of Bill Copson’s 5 wickets; Headley scored a regal 106 as West Indies were bowled out for 277. England responded with 404 for 5 thanks to hundreds from Len Hutton and Denis Compton. Headley again played a lone hand, scoring 107 out of 225 (Weekes fell for 16) as the tourists collapsed against Copson yet again. England rushed to an emphatic eight-wicket victory, and Weekes was dropped for the next Test at Old Trafford. He made his way back thanks to a savage 146 against Surrey at The Oval. He followed this by top-scoring with 54 against Somerset at Taunton and added another 67 against Warwickshire at Edgbaston, and was selected for the final Test at The Oval. Wally Hammond decided to bat, and England were bowled out for 352 towards the end of Day One of the three-day Test. West Indies were 164 for 4 when Weekes walked out to join the debutant Vic Stollmeyer. What followed can only be defined as carnage. He started rather tentatively before taking 11 off an over from Reg Perks, and then hell broke loose. When Hammond claimed the new ball, Weekes slammed 43 off the first 4 overs, including 21 off a Perks over that involved four consecutive fours. The pair added 163 in 100 minutes with Stollmeyer playing the anchor’s role with his solid defence. Weekes did not stop after Stollmeyer’s departure, adding a quick 62 with Derek Sealy before he edged one off Stan Nichols; Hammond had to leap in the air to take it with his right hand. What was the innings like? Wisden wrote: “Weekes always hit fearlessly though his stance and footwork were somewhat unorthodox.” He got a reprieve when Doug Wright dropped him off Nichols when he was on 52, but that was his only lapse: his hundred came up in 110 minutes, and if anything, he became more violent after that. He eventually fell for 137 runs, scored in 135 minutes with 18 fours and a six. The fact that West Indies had actually secured a lead went unnoticed amidst the massacre. Bright batting from Learie Constantine lit up the final day as West Indies secured a 121-run lead. England, however, were under no pressure and finished on 366 for 3 with both Hutton and Hammond scoring hundreds. World War II broke out within a fortnight of the match, and Weekes never played Test cricket again. In the process he became only the second (and one of four till date) West Indian to have scored hundreds in their last Tests. 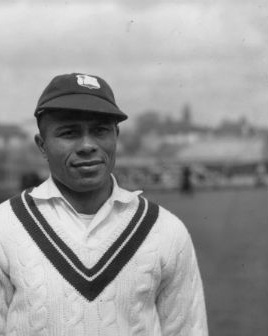 Weekes resumed cricket after World War II, but was never the same cricketer. He chipped in here and there: 72 and 48 not out and a match haul of three for 51 against Trinidad at Sabina Park, 84 and 70 against Barbados at Sabina Park, and so on. He hung up his boots after 1947-48, scoring 41 and 17 against British Guiana at Bourda. Bam Bam Weekes went back to USA to work as a nurse. He passed away at Brooklyn, New York on February 9, 1998 — 16 days after his 86th birthday. He was survived by six sons.